I wish someone earlier in my life had told me how easy it is to make and use homemade shampoo, conditioner, and detangler. For some hair types, working through and rinsing baking soda (as a de-greaser and cleanser) and spraying apple cider vinegar (as a conditioning agent) and rinsing during a shower makes their hair shiny and beautiful. And that’s that! My sister-in-law is an example. She does this for her hair, and it is long and beautiful (I should sneak up and take a picture of it). I have not been able to do this because the baking soda ( a water softener) takes the oil out of my hair, but leaves my hair flat and horrid. I have since learned that baking soda is harsh on your hair and must be used sparingly and must be followed with apple cider vinegar to balance the ph levels to neutral again. The recipe for Shampoo #1 below has actually worked the best on my hair, leaving it bouncy and not frizzy. For those of you with more normal hair that tends to get oily quick, the method below may work perfectly (like with my sister-in-law). So don’t be afraid to try them out and see what works best. 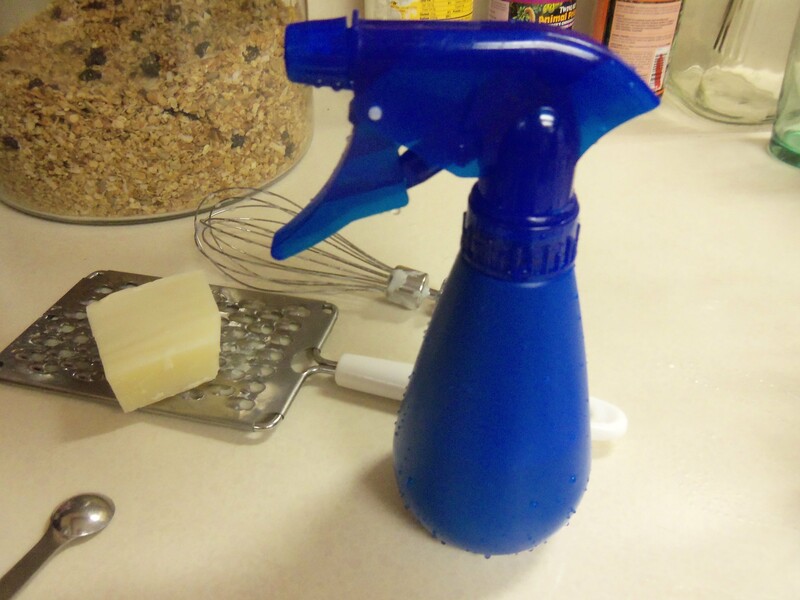 Shampoo – 1 cup water to 2 Tbs baking soda to a spray bottle. Shake before use. Spray into wet hair and work in with fingers. Rinse. 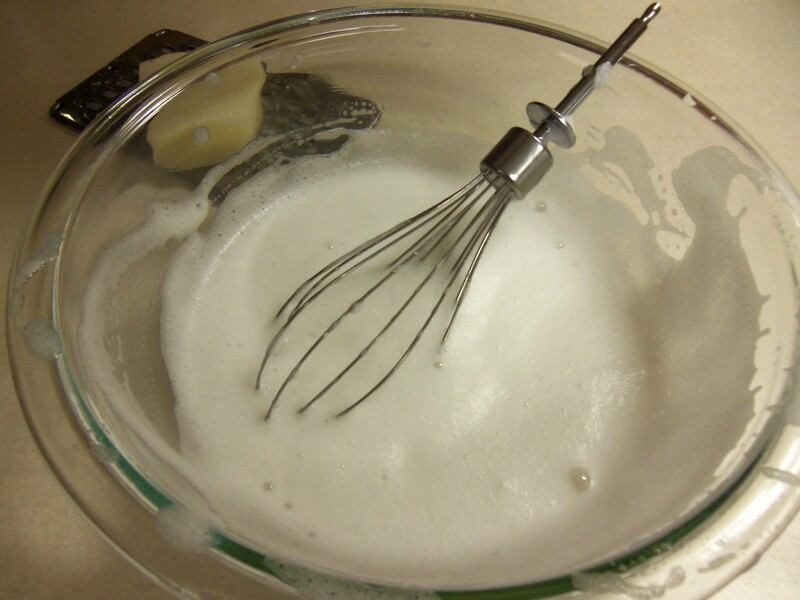 Conditioner – Always follow baking soda with apple cider vinegar: 1 cup water to 2 Tbsp apple cider vinegar. Shake before use and spray in wet, clean hair. You can also steep a bag of herbal tea in hot water before adding the vinegar. If your hair is already voluminous and not oily, you can use a small amount of coconut oil as a deep conditioner, detangler, and de-frizzer. Rub a very small amount onto your hands and rub through your hair, starting at the ends. Dull Hair: rub in 1 lemon juiced mixed with 1 cup water. Mix and add to spray bottle. I like this recipe. It’s basically oil and water so make sure you shake really well before use. 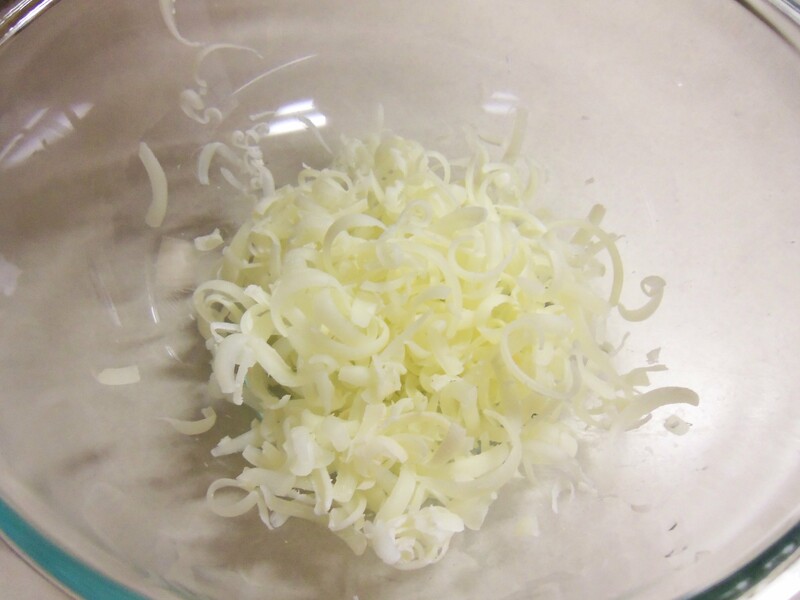 Mix grated soap in hot water until soap is fully dissolved. Mix in oils and glycerin. Pour into spray bottle. Shake before use. Thank you! I’ve read a lot about the benefits of castor oil – especially in soap making. I am using some coconut oil in my hair now, but had not thought of the combination. What a great idea! How are you combining the castor oil and coconut oil? My daughter has dry, thick brownish blonde hair. I am continuously searching for products that give her hair some sheen. I am going to try the shampoo with coconut milk. I am also going to experiment with detangler recipe #2. You have to shake it before each use. The spray bottle is great with some hair (though it clumps during the winter due to the coconut hardening so we use it in the summer). I also like to just put a little on my hands and apply it. Some of these methods look pretty inexpensive–I’m not that much into everything being natural so much as I am saving money–going to give some of these things a try and see how they work. Thanks for posting your recipes! Hey, if you can find something that works good on your hair, it is well worth it, financially speaking. Hope you enjoy. I am so excited since reading your page!! I am the only woman in a house full of MEN! My husband is 37 and is stuck on his “store” shampoo and soap. The ages of my other boys are 17, 17, 16, 14, 11, and 1 year. The older ones are like their dad, but I am hoping to conver the 11 year old and the 1 year old to using “homemade” stuff. Your site is such a money saver, and I would love for the baby to grow up using “natural” products. Your ideas and recipes are fantastic, and I thank you so much for taking the time to share them with the rest of us! God bless you, and I look forward to more of your posts! I am interested in trying the Shampoo #1. What kind of bar soap do you use with it? Thanks. Any natural bar. Olive oil or Castille tends to be thinner. Just remember that your scalp needs time to adjust to not being stripped of its oils so you may go through a two week oily stage. Mine wasn’t bad, but I had some bad hair days. The Detangler #2 recipe is fantastic! I was looking for something that doesn’t contain conditioner (we don’t use that and so don’t have it on hand) or marshmallow root (only available online). I made up a batch of this (I added a little bit of vegetable glycerin to help it emulsify and I like the result) and it made my hair lovely. I can’t wait to give it to my daughter for her fifth birthday in a few days! Thanks so much! I made a shampoo using Castle soap and coconut milk and Vit E. My hair is very fine and moderately long. After shampooing, my hair felt sticky. What is causing that? “Sticky” is something I’m not familiar with. Oily, greasy, dry, etc., but sticky? I’m not sure what happened. Whenever I use Castle soap I always follow up with a vinegar rinse to get the softness back in hair. Yes, I use half red wine vinegar, half water in a spray bottle. Hard water can cause the filmy, sticky feeling in your hair when using the recipe you’re referring to. I have hard water and my hair felt the same. I had to rewash my hair with the store-bought stuff until I can find another that i’d like to try. My name is Michell, not Michekk! Sorry bout that! Actually, just try half vinegar, half water spritzed into your hair after washing and it will smooth it out. You can also try a strangled to help with smoothness. Just found this page, i am in love with your recipes, they are fantastic!!!! Will try them and let you know my progress.Smile!!! Great! Let me know if you have any questions and I will do my best to help. Ok then thanks, will do. Take care!!!! I’ve just discovered your blog via Pinterest and I’m enjoying it. I’m looking forward to making and trying detangler #2 tomorrow. Yay! Thank you! You leave it in so use very little at first to see how much works well with your hair. Remember to shake it vigorously before spraying. After several uses, I finally figured out I didn’t need much of Detangler #2. I’m THRILLED with the results. It works beautifully and my hair looks better than usual. I have long thin hair which previously was a problem to detangle and, thus, I lost lots of hair. FINALLY, thanks to you, I’ve found a solution. I no longer dread washing my hair! Thanks a MILLION for the recipe. I’m a happy camper! This may sound like a simple to figure out, question however, I wanted to know how you cure the shampoo #3. Do you leave in the glass container with a cover on it, like plastic wrap or what. Thank you so much for your wonderful info and sharing of recipes, etc. I have been making soap bars, whipped shea butter, deodorant, etc but I wanted a very easy shampoo recipe and yours is the one I want to try. I only make my products for family, friends and gifts. I don’t want to sell it. I read and watch youtube vids and never get enough of it. The more I find out, the more I want to know. Hi Patty, I’ve been away for a few days. Sorry I’m just getting back to you. You will make this soap like you would cold process soap; in the mold of your choice. I suggest leaving it in that mold for a longer period of time because soap made with potash is softer. My grandmother used to have a tin that they poured it in and left it there to scoop out as needed for laundry, dishes, etc. You can do that as well, making sure to give it time to cure first. A month or so back you had a pin on pinterest. Of a detox hair soak. I did the recipe and now I’m no poo. My mom want to try but I can’t find that pin. It had Epson salt apple cider vineger. Baking soda. Can you email me. I have these and a set of herbal hair rinses. Otherwise you may have gotten it from a different site. If you remember the ingredients, I’d say make up some proportions and go for it! Would the fractionated coconut oil work or would you recommend a different type? Lots of information here. I enjoyed the variation of shampoo recipes that you offered. Hello, I’m at the Very beginning of trying to convert some things to natural. So, thank u 4 all ur info. I have a question, as I’ve recently read for several hours on dimithicone in haircare/skincare & found out that the only way (scientifically) to get all the dimithicone build up out/off your hair, is with a “clarifying” shampoo. Even baking soda & vinegar won’t touch it. I know, bcuz I’ve tried. However, I don’t want to spend the money on Another bottle of shampoo with all the sulfates & junk in it. So, what is your understanding & recommendation for getting all the build up off & out of your hair for someone just starting out N trying to go all natural route. Thank u!! No, I don’t like those clarifying shampoos either. Sorry, I can’t help besides the baking soda vinegar method you said you already tried. Are you sure what you’re feeling in your hair is a buildup and not minerals binding to your hair? It’s all about ph and ions when it comes to hair and if your water is hard it can make it feel like an ingredient is weighing down your hair when it is minerals from the water. Just another thought to possibly help you solve the mystery.